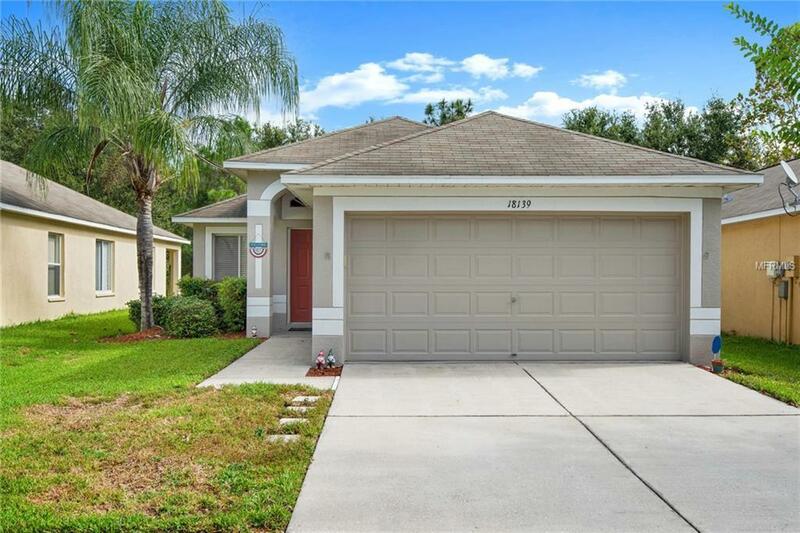 Adorable 3/2 on Private Conservation Lot in the beautiful golf course community of Heritage Isles Golf and Country Club in New Tampa! This home features an open floor plan with loads of natural lighting. WOOD LAMINATE flooring runs through all main living areas and bedrooms. Ceramic tile in all wet areas. No Carpet in this home! Kitchen is on-trend with beautiful white cabinets, soft grey walls and GRANITE COUNTERS. NEWER BLACK STAINLESS APPLIANCES. There is plenty of room in the kitchen for a dinette table overlooking the front yard. Dining and Living room are open concept with a pass thru breakfast bar from kitchen and sliders leading to the covered lanai. NEW INTERIOR AND EXTERIOR PAINT. Front bedrooms share a full bath. UPDATED CEILING FANS AND LIGHT FIXTURES. This backyard is incredibly peaceful and serene backing up to thick conservation. The community of Heritage Isles features a large resort style pool area with toddler splash zone, clubhouse, fitness, playgrounds, tennis courts and sports courts. The golf course features a driving range and 18 hole professional course. Conveniently located to I-75 for easy travel to points south and close proximity to Wiregrass Mall, Premium Outlets, USF, medical and dining facilities. The CDD Fee is included in total tax bill. Listing provided courtesy of Cornerstone Prop.International.